This Giant 4 in a row game is a great idea for parties and fun days. The set includes 42 soft discs and a disc frame with removable legs for easy storage Measures 70.5cm wide and 47.5 cm high and it comes in a box with a carrying handle. 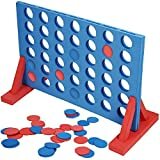 This entry was posted in Discount Childrens Toys and tagged Connect, Family, Four, game, Garden, Giant, Indoor, Kids, Outdoor by Childrens Toys and Games. Bookmark the permalink.